(seen at the afternoon performance on 9th July 2017). Interestingly, this tale of Richard The Lionheart’s minstrel was first seen at the other end of the street, when it was the opening show at the then newly refurbished Ed Mirvish Old Vic Theatre in 1983. Coming almost home, this revised version is an exceptionally brave choice by theatre owner Sasha Regan and her team. As always, the Union goes way beyond usual “Fringe” expectations with a cast of 15 and neat 4 instrument pit band. Ryan Dawson Laight comes up with designs and costumes that are both period and fun (some jeans creep in, along with ballet pumps) and the lack of amplified sound gives us the joy of natural voices. 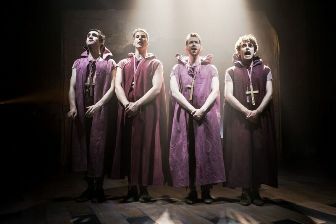 the merry Monks (David Fearn, Ryan Hall, Oliver Marshall and Calum Melville) point out, the second half is far shorter than the first… and doesn’t particularly work. It never did, probably won’t… and it doesn’t really matter. For this is a pretty jolly romp, with hilarious Tim Rice lyrics and an acting troupe that refuses to quit entertaining us for a second. 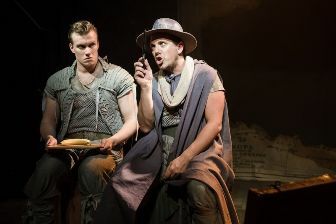 Witty commentators all, you won’t forget ‘Brother’ David Fearn’s opera-trained voice, ‘Brother’ Ryan Hall’s sense of fun, ‘Brother’ Oliver Marshall’s slight bewilderment nor ‘Brother’ Calum Melville’s dual role of Archbishop willing to compromise for his personal safety. 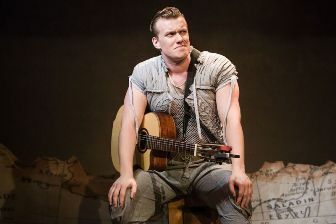 Blondel (Connor Arnold). Leading man looks, comic timing, stage presence, personality in spades, yet with an endearing humility, a future star for certain. If he survives his mother’s sandwiches (please, keep her out of the theatre’s popular café), that is. Union Theatre alumni Katie Meller returns in a very different role (minus the cheese and pickle) and proves once again her versatility in a proud performance. Jessie May is Blondel’s love, Fiona. I first saw her in “Mamma Mia” in 2010, noting then how musical theatre acting was her strongest suit. Seven years later, she’s even better – and still seemingly unaware of it. A full emotional range from joy to exasperation, a proto-feminist finding a beautiful internal dialogue in “Running Back for More” – casting directors, take note. Oh, and Ms May and her friends are also the splashiest dancers in London. 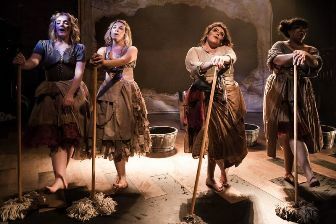 A chorus of Castle cleaners, “The Four Tubs” (as I nicknamed them) have to develop an independent touring cabaret group (or at least a “Britain’s Got Talent” act – go on, I dare them) based on their “Laundry Lament” – choreographer Chris Whittaker’s best of the fine work in the show. May, Courtney Bowman, Lauren Byrne and Michaela Stern bring the house down with mops – and help cool the front row in this over-heated auditorium, too. If we learn a little too much about one of their love-lives, no matter, all fun. What a bunch of comedians, and indeed singing actors, the lot of them, though. 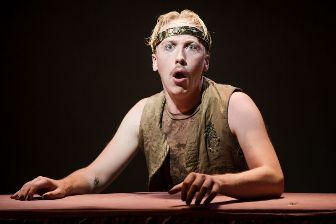 James Thackeray as brother Prince John to appear even crazier than written… and almost steal the show with “No Rhyme For Richard” (the Tubs backing group, augmented by other cast members, making it even funnier with a quick nod to more than one musical theatre hit). Hired hitman Michael Burgen (Assassin – pictured right) also gets a lovely chance to shine, spelling out his job and later despatching Monks and crowned heads alike in ever more creative cartoon fashion. 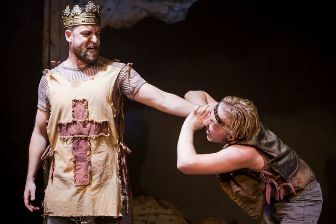 Victim Jay Worthy (Saladin / Duke of Austria / Baron) is outstanding, covering three pivotal roles and keeping each very much an individual performance – impressive concentration for sure. A quick nod too for the mysterious man in green, Craig Nash. Roger Hood, giving it to the poor, I think. Either way, we know who he is, even if Fondle will be the one we all remember. Or something. And that is the rub. The Rice lyrics are clever, the songs still sound fresh – “The Least of My Troubles” charms, “Saladin Days” is a nice tribute to the original title and “All I Need Are Words” is a real ear-worm. Sadly, however, changes made to the original show (Mathew Pritchard brought in to augment the late Stephen Oliver’s music), alas don’t solve the issue that there isn’t a lot to hang the entire evening on. This incredibly talented team have probably produced the definitive version of the show, getting every last chuckle and daftness from it, with some good points about feminism and social commentary thrown in for weight. A really great bunch of tunes, even better performed and presented, but alas finally more curio than classic in itself, which is a bit of a pity. A 5 star show with a 3 star books. It’s a 4, but unmissable – if you can snag a ticket before the run ends this weekend. (photo credit: Scott Rylander. Used by kind permission).